The SDTF is maintained entirely by annual assessments as well as by the interest that these assessment deposits earn in the State Treasury. The net premiums written by the workers’ compensation carriers in Florida and the net premium applicable to the self-insurers in Florida are the basis for computing the amount to be assessed which is expressed as a percentage of net direct written premiums. Neither carriers nor self-insurers may deduct the cost of reinsurance. However, carriers may deduct dividends paid and refunds returned to policyholders in a given quarter. These premiums are then applied to the current applicable SDTF assessment rate to determine the carrier’s quarterly assessment. Since the SDTF fund is barred from accepting new claims, why must carriers still pay the assessments? Who estimates the unfunded liability of the SDTF? 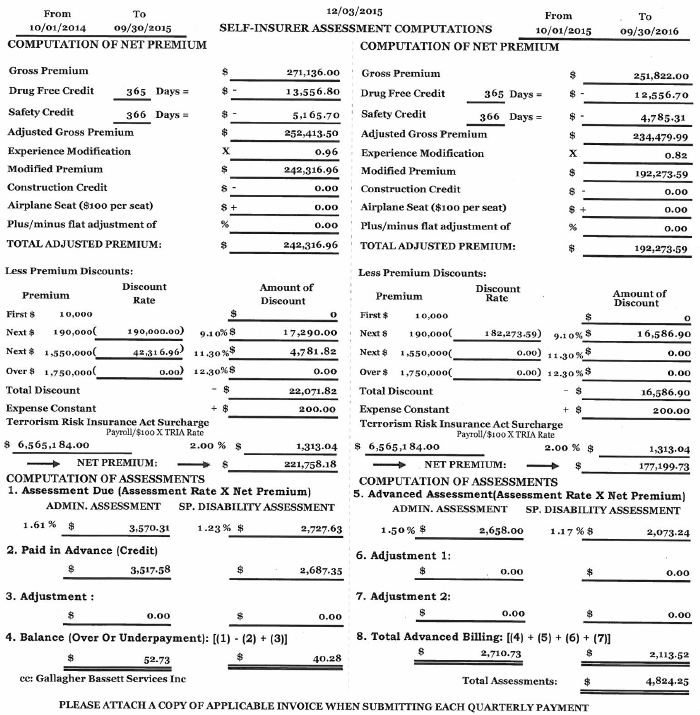 Can I see the estimated unfunded liability report of the SDTF? Are the funds in the trust fund used for other purposes besides reimbursing carrier expenses? How often is the assessment due? When is the assessment due? What if the assessment is not paid timely? How do I pay the required assessment? How is the SDTF Assessments calculated for carriers? 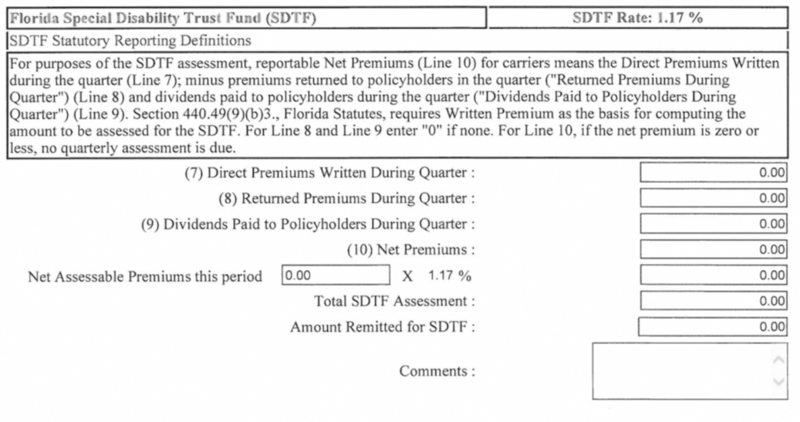 How is the SDTF Assessments calculated for self-Insurers? Who do I contact for questions on assessment rates or on payment of assessments? The SDTF was created by the Florida Legislature in 1955 to encourage employers to hire and reemploy individuals with pre-existing permanent physical disabilities. If the employee experienced a new injury subsequent to being hired and that work-related injury resulted in a greater permanent impairment, the SDTF would reimburse the employer for excess costs. The SDTF is statutorily barred from accepting any new claims for dates of accident after December 31, 1997. Since the SDTF fund is barred from accepting new claims for dates of accident after 12/31/1997, why must carriers still pay the assessments? Section 440.49(9), Florida Statutes requires that workers’ compensation insurers and individual self insured employers continue to be assessed until all the run-off claims (unfunded liability) are paid. This estimated liability has been substantially reduced over time and is independently estimated to be $1,087,287,182 as of June 30, 2015. The average administrative costs per claim. The department or administrator shall submit its report to the Governor, the President of the Senate, and the Speaker of the House of Representatives by December 1 of each year. No. Florida statute strictly prohibits the Special Disability Trust Fund moneys from being used for anything other than the stated legislated purpose of carrier reimbursement. The SDTF assessment is (like the WCATF Assessments) an annual assessment that shall become due and be paid quarterly. Such amounts shall be paid within 30 days from the date that notice is served upon such carrier or 30 days after notification is sent, whichever is later. If such amounts are not paid within the required time period, there may be assessed for each 30 days that the amount so assessed remains unpaid, a civil penalty equal to 10 percent of the amount so unpaid. If any carrier fails to pay the amounts assessed against him or her under the provisions of this section within 60 days from the time such notice is served upon him or her, the office, upon being notified by the department, may suspend or revoke the authorization to insure compensation in accordance with the procedure in Section 440.38(3)(a), Florida Statutes. All payment must be accompanied by an invoice obtained through the web-based START System. Your WCATF assessment must be paid at the same time as the SDTF Assessment. How are the SDTF Assessments calculated for carriers? How are the SDTF Assessments calculated for self-Insurers?